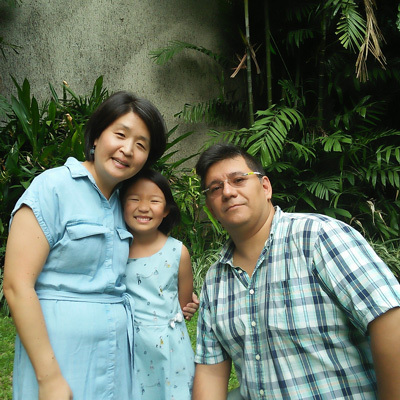 Cathy and Juan occasionally return to the U.S. to visit congregations. 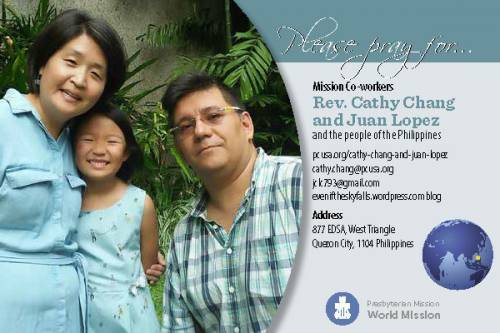 Email them to learn about their schedule and invite them to visit your ministry. From their home base in Manila, Philippines, Cathy Chang and Juan Lopez help global partners address issues of migration and human trafficking. The UN’s International Labor Organization estimates 21 million people are victims of coerced labor and/or forced sexual exploitation. While human trafficking is a worldwide problem, countries in Asia are increasingly vulnerable. Cathy and Juan will work with Asian churches and non-governmental organizations to help coordinate efforts related to the scourge of modern-day slavery. They will also resource various programs of the Presbyterian Mission Agency and U.S. congregations concerned about the issue. Almost two-thirds of the world’s inhabitants are clustered in Asia and the surrounding Pacific region. While Christianity is the faith of a small minority of people in this vast area, the church is growing in places like China, Korea, the Philippines, Taiwan, and Vietnam. In recent years, much of the region has experienced economic expansion, but many Asians have not shared in this prosperity. The Presbyterian Church (U.S.A.) joins with Asian partners as they proclaim Christ’s good news and confront issues such as climate change, food security, health care, education and human trafficking. Cathy and Juan focus their vision on people whose dreams have been denied. They carry a deep concern for those whose hopes for a better life for themselves and their families have been dashed by human traffickers. “I pray the Lord would lead and guide us as we address migration and human trafficking by participating in God’s work to redeem economic systems of exploitation and exchange them for life-giving opportunities and education, while tending to the healing of peoples’ bodies and spirits,” Cathy says. Cathy and Juan discovered each other and their enduring passion for mission in 2002 while serving in Egypt as young adults. Cathy was working with the PC(USA)’s Young Adult Volunteer (YAV) program, and Juan was serving with Chrétienne en Orient (Christians in Action in the East), a mission agency supported by French Protestants. “In Egypt, we started dating and dreamed about the possibilities of serving in mission together,” Cathy says. A long engagement ensued, with Cathy returning to the United States and eventually attending seminary, and Juan returning to France to begin a career in social work. The couple is inspired by Genesis 12:1-3, where God called Abram to go “to the land that I will show you.” They identify with Abram not because their families have experienced exile, internal displacement, and immigration. Instead, they look to God’s promise to Abram that all families of the earth would be blessed through him. In France, Juan was a social worker with Foyer de l’ Enfrance Charles Frey (Hearth of Youth Charles Frey) in Strasbourg. He holds a master’s degree in sociology from Marc Bloch University in Strasbourg, France. He is a member of Memorial Presbyterian Church in Midland, Michigan.